LandGirl1980: Splendid Sponsors - The Leather Satchel Co.
You know, as well as I, that I love a good satchel. And that my search - nay, HUNT - for one was frivolous and fruitless. Enter The Leather Satchel Co and my Satchel of Love. The "Best Customer Service I Have Ever Had" Award still belongs to them. I have heard they keep it on their desk. You may have noticed, to the right of the screen, that I have some sponsors of my humble wafflings. I have, as yet, not fully introduced you to this family run business. How rude of me! So, here it comes! Consisting of a few of the last remaining leather smiths in the UK, they are registered as Master Craftmen. They make all their satchels here in Blighty, by hand. None of this robot-machine malarkey for you and your satchel. Oh no. Hand made, by people who know what they are doing. * Deeper Gussets - effectively allowing you to slide in more of your precious everyday items. * Longer shoulder strap fab if like to wear your bags low. * Shoulder Strap Pad - great if you are lugging books to and from school or Uni. * Multi-colour options - cutting various parts of the satchel from different coloured leather to enable you to make your satchel even more individual. * Magnetic Fasteners - wonderful for a quick access satchel. Imperative for the commuter. Say goodbye to those fiddly moments at the ticket barrier. * Custom size - need a satchel for your laptop? Worried it might not fit? Worry no more. Sounds pretty smashing, dunnit? 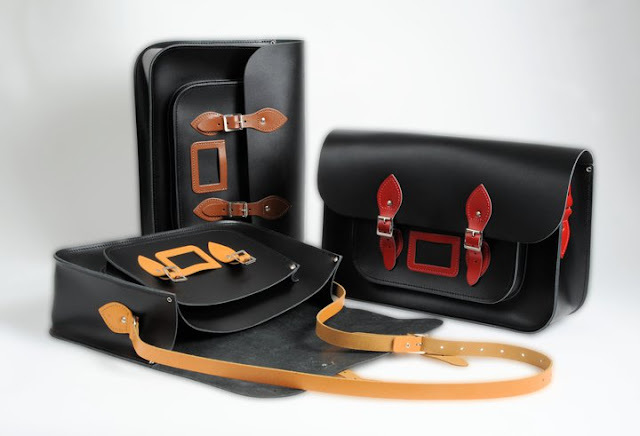 With some companies you may have to wait a while as your specifications come to fruition - but with the Leather Satchel Co - most custom satchels are at your address within 7 days for UK residents, and just a little longer for those overseas! I also love the colour ranges that they have on offer. From charcoal black, pillar box red, dusky pink and highlighter fluorescent yellow, there are a lot to chose from. For the 12.5 satchel I have been testing out for them, I toyed and toiled over what to have. I was offered all of the above customisations. The thought of the lovely chestnut brown of my original satchel, mixed with perhaps the front buckles and identity pocket in that glorious olive green, taunted me for a while. But I already have a chestnut one. So - I decided on a satchel of purest tan. Not the most imaginative I could have been, granted. But I use a lot of tan in my accessories in the form of shoes & belts, and I wanted something that I knew would match. Co-ordinated as like to be! And some luscious embossing. I had lengthily chats with Keith and Gail about my ideas. 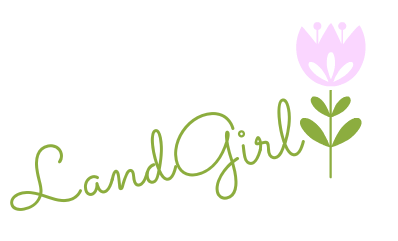 The idea of having the Land Girl emblem on the front was banded about. But in the end I decided to keep it simple. Loving history as I do, I felt no other saying would do. And here it is! In all it's glory. Once I had decided, I had my new bag baby within 5 days. Just in time for me to take it off to France for my history holibobs! Being smaller than my original, I was worried about it dealing with all my holiday needs. You know; book, ipod, sunglasses, sunblock, camera, makeup, water, random bits of collected toot. And it handled them all like a dream. In fact. I have to confess that I have permanently relegated my original satchel in favour of this beauty. I love the front pocket that holds the bits I need to grab hold of, like my train ticket, work pass and keys. And the size is also more than adequate for all the other stuff I haul about with me. Basically the above, minus the sunblock and sunglasses. I love the comfort of the strap when it is just one one shoulder. It really stays in place. But there is enough length in the strap for it to be worn across me too, which is usually how I wear it as an ever wary commuter. The magnetic buckles are also adjustable for a tighter or looser fit as needed. Excellent if you have a novel that is taller than the average book about your person. In short, you all know I fell in love with The Leather Satchel Co way back, and I am so pleased that they are now one of my blog sponsors. Remember, you can catch them on Facebook - where they often run competitions and also occasionally have seconds for sale - and you can also tweet them @leathersatchel. Prices vary, depending on your specifications, but you will find them incredibly helpful, communicative and down right decent. Yum! Those are some delicious bags and what a fantastic selection of colours. I love how you've styled your choice. I bet that classic colour would go with just about naything though. Oh boy, that satchel is perfect! And goes so well with your outfit, too. Lovely, I like the fact that something can be embossed on it. Have signed petition...ooh, the shame, made spelling mistake, but my brain dribbles away when I type!.... this sort of thing is something I feel very strongly about, it's dreadful that they think they can do this. You have 'sold' the company to me on every level - quality, credentials, colour range, variety, personalisation possibilities. I feel absolutely justified in coveting one of these delectable satchels. Love your description of them too, as 'downright decent'. Oh and I do hope that it's OK with you that I put a link to your review of Land Girls by Angela Huth on my most recent post. LC - ooh dark green! With silver embossing? Thrifty - thanks me love! Jennie - hurrah! Santa cant arrive soon enough! MV - hint, hint , hint and then HINT some more for good measure! LW - thanks for stopping by, commenting and signing the petition. Gosh that sounds an amazing company!!!!! I love mine too, their stuff is really gorgeous! You know, I would have sworn you'd go for the neon yellow... hahahahaha!! I am loving that they do one in pink. LOVING. Might have to invest in one, for all my geeky teacherish equipment. adorar the pic of you in green scarf and lovely sandals.I quite like the red and black one, I like that they are roomy too. will go check them out. This post was the clincher that made me purchase from the Leather Satchel Co., and I LOVE my Loch Blue satchel. Thank you! Also, I thought I'd share with you my own buyer's guide to leather satchels. Couldn't have done it without yours! This is gorgeous! I've been struggling to decide whether I want my satchel from Cambridge or Leather but this post is making me a little more partial to theirs. I love your choice of colour and embossing.